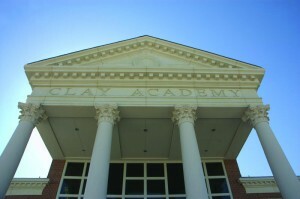 An entablature is the superstructure above the column but below the roof. The architecture of the entablature is generally chosen to match the architecture of the column. One would not put a Doric entablature over an Ionic column, for example. Entablatures are comprised of three parts: the architrave, the frieze, and the cornice. The architrave rests directly on the column, with the frieze on top of it, crowned by the cornice. Each part is further divided. These divisions vary by order. Stromberg Architectural Products is one of the world’s most prolific manufacturers of GFRC entablature. Doric Entablature are relatively plain. They match the Doric columns. The entablature is generally two times the diameter of the column on which they rest. The architrave is split into three parts: guttae, the regulae, and the taenia. The frieze has sets of three vertical tablets, called triglyphs, seperated by flat spaces called metopes. In some buildings, these metopes are decorated with scenes of valor. The cornice is also split into three parts: the soffit, the corona, and the cymatium. The Ionic Entablature adds some frills to the plan Doric Entablature. The architave gains a layer called the fascia while the cornice gains some dentils. The frieze does not gain a layer, however. In the Corinthian Entablature, the frieze gains quite a lot. It becomes a six layer piece. The layers, from top to bottom, are the cyma recta, the fascia, the modillions, the ovulo, the dentils, and the cyma reversa. Sometimes the frieze is omitted altogether, however. In the Tuscan Entablature, Doric simplicity again reigns. At only one and three quarters the diameter of the column upon which it sits, the Tuscan Entablature is the plainest and smallest of the Entablatures. Finally, the Composite Entablature mixes elements of one or more of the other Entablatures to form a unique Entablature. It is also generally the largest Entablature, at two and a half times the diameter of the Composite column. Entablatures require strength and durability in order to support the roof upon the columns. Stromberg GFRC is an excellent choice for strong, durable beauty that can be cast in all of the ornate shapes necessary to create the Classical Entablature. What ever the type of Entablature you choose, Stromberg GFRC can create it. Newport News Police Station: Because police stations must function in all weather conditions as well as provide a secure environment to hold prisoners, durability is important. Stromberg GFRC provided the strength and durability needed for entablatures, columns, pilasters, portico and rooftop arches, window headers and other architectural features. Anywhere there are columns, Stromberg GFRC entablatures are appropriate. A classic column needs a classic entablature, and Stromberg GFRC makes both. Professionals at Stromberg Architectural Products are waiting to assist you with your GFRC project. Stromberg offers design assistance, CAD details, and specifications. Visit Stromberg Architectural Products for more information about landmarks in quality GFRC, or call (903) 454-0904. Stromberg is here to help, and the initial consultation is free.